We’d love your help. Let us know what’s wrong with this preview of The Elizabeth Cady Stanton-Susan B. Anthony Reader by Ellen Carol DuBois. The documents delineate the progress of American reform politics from Stanton's speech at Seneca Falls in 1848 into the early twentieth century, when a conflict developed between the two feminists over woman suffrage. In her new introduction, Ellen Carol DuBois considers the current historiographical perspective on Stanton and Anthony. 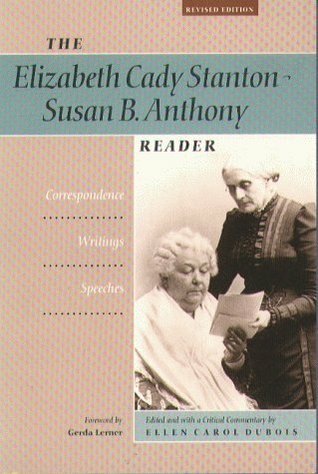 To ask other readers questions about The Elizabeth Cady Stanton-Susan B. Anthony Reader, please sign up. this book was very good. Similar to a text book a little bit,k but I learned alot about the time when these two women were around, and how difficult it was for them both. Also, it showed what pioneers they were. Ellen Carol Dubois is a distinguished professor of history and gender studies at the University of California, Los Angeles. She earned her bachelor's degree at Wellesley in 1968 and her Ph.D. from Northwestern in 1975.